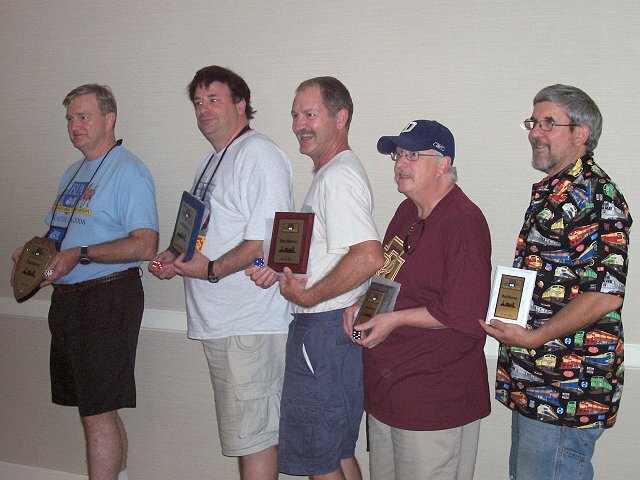 From left to right: Mark McCandless (champion), Gus McDonald, Mark Kennel, Tony Newton, and Chester Lanham. Picture courtesy Paul Van Bloem. The number of Rail Baron players fell this year, due in large part to the absence of several RB families who usually bring lots of players. Hopefully, we will enjoy their company next year. Those who did play enjoyed our usual feast of agony and ecstasy. This year, those that made it into the semi-final did so by wins pretty evenly spread through the three first-round heats. A few players kept playing ‘till they got a win, and many good, experienced players played in every heat, trying for that elusive win, but will have to wait for next year. A few of you who didn’t win can blame Assistant GM Chester Lanham, who this year joined a tiny, elite group of players who manage to win all three of their first-round heats. While he didn’t win his Semi-final game, his three wins got him seated at the Final game. Only one other player, Bill Duke, won more than one first-round heat, winning two. Two players who won a first-round heat did not show up for the semi-final, and another player who qualified as the first alternate to play in the semi-final also did not show up. Tony Newton, one of the players who did not win a first-round heat, took a seat at the semi-final as an alternate, and won the game, landing a seat at the Final. The record for the most hostile destinations in the first-round heats or semi-final appears to have been won by Scott Chupack. His first five destinations in Heat 1 were friendly, but of his next 15 destinations, only two were friendly, and the remaining 13 were hostile. However, he did win his Heat 3 game. Bill Duke had the most destinations (29) in Heat 2, with Chamblee Shufflebarger close on his heels with 28 destinations in her Heat 3. Playing all of our games in the Marietta room was a pleasure, and scheduling the games for a longer time frame reduced the stress level for those playing. A few first-round heats went a little longer than 4 hours, but did not have to be adjudicated. I played in one first-round heat that was completed in 3.5 hours, so with a little effort, many games could be speeded up. Very noticeable was that most winners held the AT&SF, followed closely by the UP. Relatively fewer winners held the SP. In the Northeast region, owning the PA did not ensure a win. The B&O did just as well, followed closely by the NYC and C&O. In the Southeast, the SAL and L&N did equally well, and to no surprise, most winners held a Northwest RR. Only a half-dozen or so game winners held the NY&NH and/or the B&M, which seems to lessen their importance. Surprisingly, many winners held the CB&Q and/or SLSF. 2nd place: Gus McDonald – PA, SP, ACL, GM&O, CMSTP&P, SLSF. 3rd place: Mark Kennel – NYC, SAL, L&N, MP, T&P. 4th place: Tony Newton – CB&Q, N&W, GN, UP, WP, D&RGW. 5th place: Chester Lanham – B&O, CRI&P, SOU, NYNH&H, B&M. Once again, my thanks to Assistant GMs Paul Van Bloem and Chester Lanham for their help, and thanks to all the players who enjoy keeping Rail Baron alive. Any BPA GM who wishes to create a Web page for his/her game is welcome to copy the HTML of this page and modify it as needed.